This has been a busy time for our student staff (SALCers) and SALC Student Committee (SSC) as they have been involved in planning a series of lovely events in the run up to the winter holidays. The festivities have included tree decorating, card making, and new year goal setting. At the entrance of the SALC you will see displays and posters – come and have a look! Also, don’t forget to follow us on FaceBook (https://www.facebook.com/thesalcandeli). 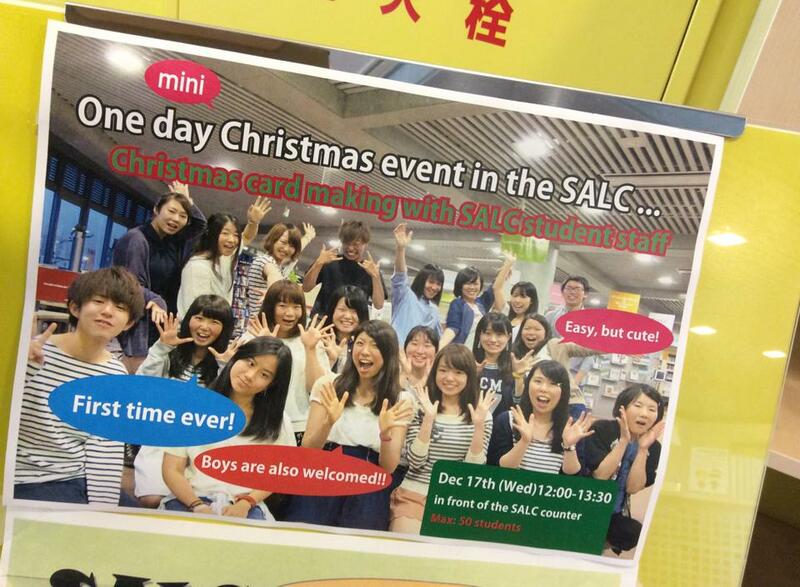 Today we hope to have a good turnout at the ELI / SALC Christmas Party where there will be prizes, games and food. See you there! Every January after classes end the SALC offers 4-5 workshops in order to encourage learners to continue to use the SALC and think about studying English during the break. This year, these workshops will run during the week starting 19th January. Remuneration for running a one-off workshop is 10,000 yen a time. The workshops are aimed at fostering learner autonomy and self-directed learning skills, encouraging the use of learning strategies, teaching learners how to use the SALC better, and, ideally, promoting some of the materials we have in the SALC. You can see some of the recent workshops on the “Let’s Study English” website under “past workshops” (http://elisalc.org/category/past-salc-workshops/). 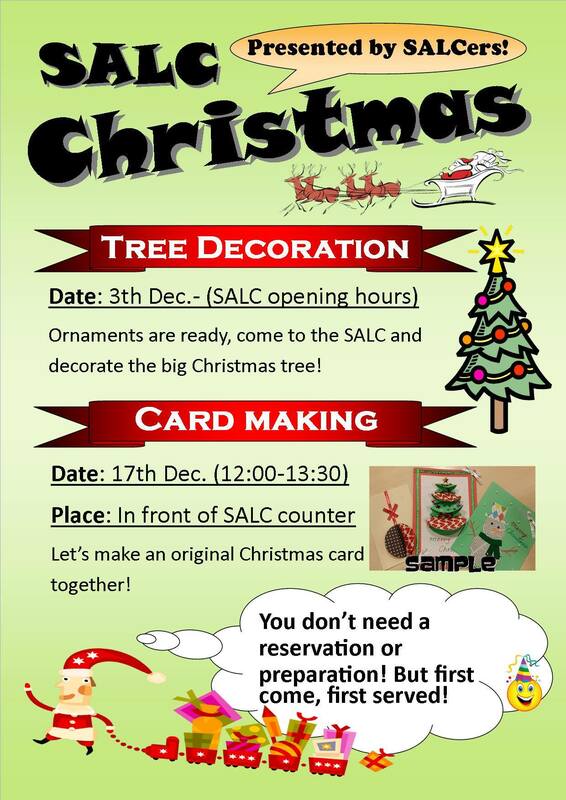 The SALC student staff were invited to come up with some ideas for events for students to enjoy in the SALC in the run up to the winter holidays and have come up with several creative suggestions. The activities kicked off last week with Christmas tree decorating. Next week they will be showing us how to make Christmas cards. Also, check out the display on the yellow wall at the entrance to the SALC!